Pressure washing is the application of high-pressure water spray at 300 degrees Fahrenheit. Produced by specially-designed high-pressure pumps, this spray is a hundred times more powerful than the typical garden hose. 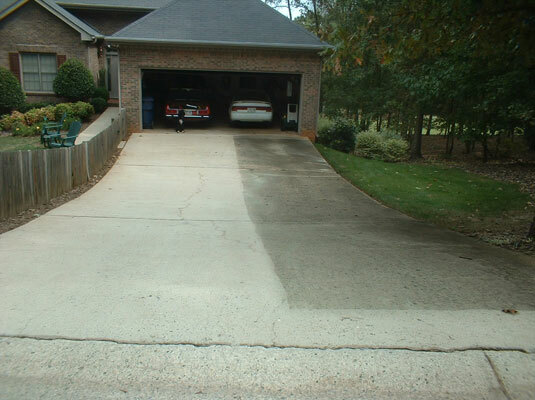 It is typically used on concrete to remove unsightly mold, bubble gum, and other dirt stains. A garden hose can deliver anywhere from 9 to 23 gallons per minute, depending on both the diameter of the hose being used and water pressure provided to your house from the local water authority. Matria Pressure Washing pumps water at pressures reaching 3,500 PSI with water heated to 300 Degrees Fahrenheit. Additionally, our machines deliver a much more ecologically-friendly amount of water, with only between 4.5 to 7.0 gallons per minute. This amount depends on the nozzle used for the job. Based on these two comparisons, Matria Pressure Washing is both more effective and more efficient for cleaning than a garden hose. A pressure washer uses significantly less water than a garden hose and the the cleaning power of the pressure washer is more noticeable than with a typical garden hose. using Matria's Pressure Washing system. The right side was cleaned with a garden hose. Matria is fully Licensed & Insured. We carry workers’ compensation insurance and comprehensive general liability insurance.